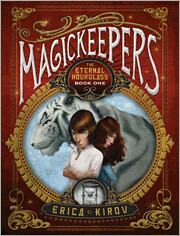 Welcome to the Magickeepers Blog Tour! You'd think having your birthday on the last day of school would be fun, but when your report card is dismal, you live in a hotel, and your father is the worst magician in all of Vegas? Eh. It all changes of course, when Nick's Grandfather gives him a key and the best magician in Vegas whisks him off to meet his extended family, which is full of magic. Real magic, not just illusion and trick. Kirov interweaves a lot of Russian culture, food and history (Princess Anastasia and Rasputin play major roles) in a solid adventure story complete with crystal balls, flying swords, tigers, and an hour glass that stops time. This book really sets up the series and I'm looking forward to the next one. It looks like a lot of the adult characters that Nick is meeting have both their good sides and bad sides, which is exciting. While Nick's family are the "good guys" it's apparent that they obtained many of the magical artifacts they're so carefully guarding through trickery or outright theft. Lots of murky morality to discuss. Combined with the magic and adventure (a great book for boys!) this is an excellent candidate for book discussion groups. I'm very much looking forward to the next books in the series. For reasons I can't fully explain, this book reminds me of Alcatraz Versus The Evil Librarians. They are similar in the fact that "boy meets a ton of distant cousins with crazy powers and goes on adventures to save the world" way, but that's similar to a lot of books. Nick never talks to the reader the way Alcatraz does, but there is something about each book that I think if you like one, you'll like the other. Full disclosure: copy provided by publisher.